Fairfax, VA — It is an abortion facility inspection report that reads like a medical horror novel. There were two unlicensed “doctors” on staff. One abortion patient was rushed to a hospital emergency room because the facility had no sutures with which to repair a profusely bleeding injury. Administrative oversight had completely broken down. Hand-washing was non-existent. Overall filth permeated the entire office. These were the conditions found at Virginia Health Group, a then-licensed surgical abortion facility in Fairfax, Virginia, after a complaint prompted an inspection on April 4-5, 2016. Those conditions were so deplorable that the Department of Health indefinitely suspended its abortion facility license and ordered it to immediately halt surgical abortions. “In aggregate, the deficiencies pose a substantial threat to the safety of patients and staff of the Virginia Health Group,” wrote State Health Commissioner Marissa J. Levine in an April 6 letter notifying the facility of the immediate suspension of its abortion facility license. This alone was notable since Levine is an abortion supporter who openly opposed regulations that required abortion facilities to be licensed and meet minimum health and safety standards. Without the complaint, the flagrant problems my never have been discovered. In fact, the Virginia Health Group had long posed a threat to women. The Virginia Health Group is owned by the disgraced abortionist Steven Chase Brigham, who continues to operate the disreputable American Women’s Services chain of abortion facilities in several states despite the fact his medical licenses have been revoked in every state he was licensed. Brigham’s facilities are so bad that even the National Abortion Federation, itself representing some of the nation’s most appalling abortion providers, is calling for their closure. “Evidence of wrongdoing at Brigham’s American Women’s Services facility in Fairfax is part of a clear pattern of repeated and serious misconduct that poses a significant threat to patient safety, and which cannot be allowed to go unchecked in Virginia,” wrote Vicki Saporta, president of the National Abortion Federation, in a statement to the Washington Post. In 2012, under the former administration of Gov. Robert F. McDonnell and Attorney General Ken Cuccinelli II, both Republicans, Virginia enacted abortion clinic licensing requirements that were meant to ensure facilities met minimum safety standards. It required abortion facilities to submit to inspection to ensure that they complied with the new licensing requirements. The Virginia Health Group did not. During its initial licensing survey, Virginia Health Group was cited for 13 pages of deficiencies, including inadequate infection control, an exam table top that was torn and could not be sanitized, expired medications, shoddily kept medical records, and inadequate ventilation. Many of these issues were never corrected. Nevertheless, the Virginia Health Group was issued an abortion facility license. Two years later, under the administration of Gov. Terry McAuliffe, a pro-abortion democrat who vowed to repeal Virginia’s abortion safety regulations, Brigham’s Virginia Health Group requested a variance for 10 years, exempting them from meeting the building requirements, such as having hallways wide enough to accommodate a gurney in the all-too-likely event of a botched abortion. Health Commissioner Levine granted a variance for a shorter term of one year, allowing it to continue its abortion business in a substandard facility. In the end, the building requirements, which were similar to those struck down by the Supreme Court last month, have never been enforced. Deficiencies cited were reminiscent of conditions found at Kermit Gosnell’s squalid “House of Horrors” abortion facility. In fact the commonalities between Brigham’s now-shuttered Virginia Health Group and the Gosnell office are startling. Unlicensed “doctors” and unqualified staff, filthy conditions, improperly sanitized instruments that spread venereal diseases among patients, and a lack of training for emergencies were hallmarks of Gosnell’s practice. Similar conditions existed at Virginia Health Group. The facility was found to be in a serious state of disrepair. The entire facility was described as “dirty.” There was chipping and peeling paint on smudged walls marred by graffiti in the waiting room. Both the cloth seating and the carpet were soiled and bore numerous large stains. Cabinet doors were found taped together, and when an inspector attempted to open them, one of the doors fell off revealing the contents that were also crusted with filth. Private patient medical records were kept in boxes and stashed in the patient bathroom and patient counseling room. One box was found tipped over with papers spilling out onto the bathroom floor. In an eerie similarity to Gosnell’s abortion facility, inspectors noted a procedure table with a torn surface – most likely the same torn table cited during the initial 2012 licensing inspection. Brigham’s facility was operated amid chaos and a failed administrative oversight structure. At Virginia Health Group, the acting clinic administrator, identified in the deficiency report as “Staff #1,” had stepped down as the clinic administrator just two weeks before the inspection and had not been replaced. Staff #1 was identified in a letter from the Virginia Health Group as Ebony Fobbs, a certified medical assistant who was later fired. When the inspector requested the Staff #7’s employment and personnel records, none could be produced. It may seem like a small thing that the facility did not maintain a file with documentation of employee credentials, but there is a critical reason for such a requirement. It is to verify their education, training, and qualifications to conduct medical duties. “I have passed all my tests but I do not have a license . . .” Staff #7 admitted. It was Staff #7 who spent just two short sessions training one staff member on the examination and verification that tissue was removed during the abortions. This inadequate training posed the life-threatening possibility that women suffering from undetected ectopic pregnancies would never be alerted to their serious conditions due to incompetency of poorly trained staff. But Staff #7 was not the only “doctor” listed on staff that had not bothered to obtain a Virginia Medical License. Since the abortion facility operated a lab, it required CLIA (Clinical Laboratory Improvement Amendment) certification. That certification requires that the laboratory director to be a licensed doctor of medicine, osteopathy, or podiatry. However, closer investigation revealed that Staff #8 was no longer employed by Virginia Health Group, neither was he/she licensed to practice medicine in Virginia. There was no training in the event of an emergency, so one can only imagine the confusion when one abortion patient, who suffered heavy, uncontrolled bleeding due to a lacerated cervix had to be transported to the hospital because the clinic had run out of sutures. The procedure room lacked a sink for and washing, but that did not seem to matter much to the abortion facility staff, who did not wash much anyway. 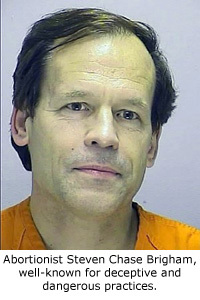 An abortionist with visibly bloody gloves handled bottles of medications. Another worker plunged a toilet that appeared to suffer from chronic clogs, then went to the procedure room to hold the hand of a patient – all without washing. There was inadequate infection control, expired medications, and a long list of poorly maintained equipment, including an autoclave used for sterilizing surgical equipment. But the autoclave had run out of distilled water, so equipment hadn’t been sterilized for several days, even though the acting administrator admitted she had distilled water in her car. Such were the conditions at Brigham’s Fairfax abortion facility. There can be some solace in the fact the Virginia Health Group appears to have permanently closed. Eric Bodin of the Virginia Department of Health announced on June 2, 2016, that the facility had withdrawn its lengthy request for an “informal fact-finding conference,” essentially assuring that its facility license will not be reinstated. Ironically, the same laws that the pro-abortion administration of Gov. Terry McAuliffe wants to nullify are the same laws that exposed and closed Brigham’s dangerous, back-alley-style abortion clinic.